Who wants power? We do! How do we get power? An electrician, of course! Electricians are in high demand, as the career can be quite intricate and dangerous at times. With the proper use of safety codes and understanding what the job entails, anyone can be an incredible electrician. Let’s take a look at what you have to do to be a certified electrician, today. Electricians work on electrical equipment in our neighborhoods. From installing new electrical boxes, to upgrading or maintaining used ones, electricians should know all about power, lighting, and electricity control systems. Each job requires an electrician to look at a blueprint, understand what needs to be done, and then physical perform the requirements on the electrical box or other electric equipment. Some electricians are skilled in very specific areas, such as installing electricity for homes, while others may be skilled in highway electrical systems. It is important to learn all that you can in order to be a diverse electrician, one that can go from job to job and work independently with confidence. Every state has different salary ranges per year for electricians, so depending on where you plan to work, you could make more money than the state next door. Larger populations, such as New York, Washington, and Texas have higher pay rates than say Utah and Wyoming. If you’re looking to make the big bucks as an electrician, you may want to head on over to Alaska, which is the number one state where an electrician can make up to $85,000 a year. Typically, though, the average salary for a novice electrician is roughly $30,000 a year. Experienced electricians can make around $55,000 a year, and Expert electricians with many years on the job can make nearly $68,000. Before you get started on your endeavor to become a certified electrician, make sure you take the time to learn about all the different type of electricians, and what they do, so you can understand better which type of electrician you want to become. Find an apprenticeship that will suit your needs. There are many ways to start an electrical apprenticeship whether it be through a technical school, community college, or even an employer, the goal is to learn and understand everything you need. After you graduate, whether that’s with an associates degree or a certificate, it’s time to find a job! Get out there and hunt down your new career. Once you find a job, you’ll do some on the job training in order to complete your licensing test. When you gain enough knowledge, it’s time to show the world what you can do. Go out there and take your licensing test in order to become a journeyman electrician. If you are one of the three high school students who knows what they want to do after graduation, then you may want to think about taking some electrical engineering, physics, and math classes during your junior and senior years. After you graduate, it’s wise to either start training at a technical school, get a certificate, go to a community college that supports studying to be an electrician, or even getting an apprenticeship at a local power company, either way, you are going to need a lot of training and hands-on experience. Getting a certificate can take about a year and is good for those people who want to move into a career quickly. Though, this type of education is going to give you the least amount of information, as certificates are typically better for electricians who want to brush up on their knowledge. A technical school or receiving an associate degree at a community college is going to take around 2 years. It may seem like this takes a long time, you’re gaining quite the education, and not just in electrical technology. You’ll also have paid on the job training, that can result in a career when you graduate. Lastly, there are apprenticeships, which is hands-on training with qualified electricians. This can last for up to 5 years, the real world experience will get you closer to that license. On the job training can last for about 144 hours of technical training, and over 2,000 hours of hands-on training. That’s not going to happen in just a 40-hour work week. Each state has a different course to achieving your license, but typically you’ll need to take an exam to become certified as an electrician. The education doesn’t end after the exam, though, you’ll want to continue learning and keep up to date with codes, and even get specific certifications. 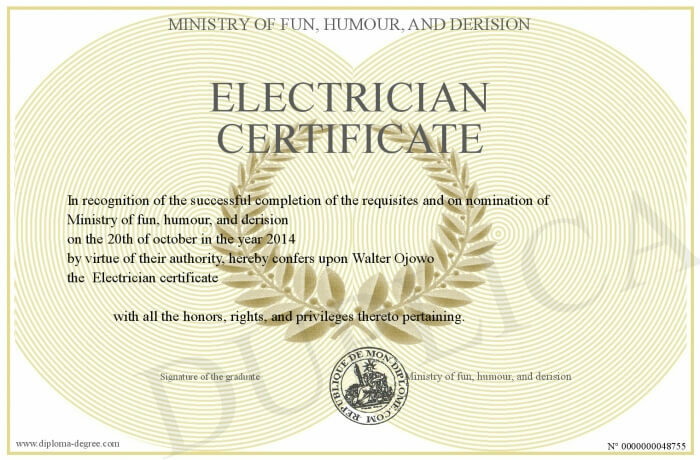 There are different types of licensing for all types of electricians. A journeyman license is given to anyone that completes the apprenticeship program and passes the Electrical Journeyman exam. In order to take this exam, you’ll have to prove you have the experience as well as the classroom time to take the exam. A master electrician license can be granted after working two years as a journeyman electrician and passing the Master Electrician exam. In order to take this test, you must have letters of reference from previous customers, you must also apply for this test, you aren’t just granted the test because you want it. Every state requires the passing of the exam in order to be licensed as a Master Electrician. Each state has their own requirements for the type of licensing necessary, and the way to achieve that licensing, so check with your state or local Electrical Contractors Board to get more information. Training can take from one year up to seven. The demand for electricians is high, as the rate of population growth continues to expand. Electricians that have a wide variety of talents are more likely to be hired than ones with a specific set of skills. There is a larger demand for electricians in peak building times, though periods of unemployment can occur when the construction slows. The growth of solar and wind power may result in more jobs for the installation process. That's a higher than average projected growth of 59,600 jobs. Should You Become an Electrician? Electricians rank number three in the best construction jobs. The upward mobility for an electrician is below average, as there aren’t many opportunities to advance or get a raise in salary. The stress level is above average, the jobs responsibilities and schedule can be demanding. The flexibility of the job is below average as well, often times the hours are late and depending on the issue, most things need to be fixed before you can go home. Depending on the experience, level of education, and position within the company that you work for, your salary can change. For electricians with one to two years’ experience, with a high school diploma and certificate, a salary of around $55,000 can be expected. Electricians with 10 or more years’ experience that also have an associate degree may make closer to $60,000. The more training and on the job experience that you have, the higher the salary is likely to be. The job growth for an electrician is expected to be better than most careers from the year 2014-2024. The job market is likely to see a 14% increase, and almost 90,000 new jobs in these ten years. New homes and buildings are going up daily to accommodate the growing population. Depending on the route you want to take, education can be between one year and four years. The electricians that take more time going to school and learning a variety of methods have an easier time finding a long-term career. 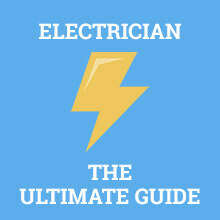 A lot of the education for an electrician is hands-on, and on the job, training is very high. The more experience you have in the field, the easier it will be to find a long-lasting job. An apprenticeship can last between 3 year and 7 years, depending on your level of aptitude. Time management skills- often times an electrician will have more than one customer a day, so being able to manage time is key to getting everyone back on the grid. Problem solving skills- You may be working alone, which means you’ll need to think on your toes. Customer Service skills- Customers don’t want rude and distrustful people in their homes or businesses, so being able to talk and interact with customers, be friendly, and accommodate others is essential. Physical strength and endurance- You’ll be on your feet for quite some time, and you’ll likely be lifting equipment over 50 lbs. Critical and logical thinking skills- This will help in diagnosing problems, as well as thinking outside the box when it comes to finding solutions. Leadership skills- You may be training a new electrician one day. Mathematic and scientific knowledge- Understanding basic math and science can get an electrician out of some tight jams. Electrical standards knowledge- With all different types of installations, repairs, and upgrades, it’s important to know what to do in each situation. Independence- Electricians typically work by themselves, which means you’ll likely be relying on your own ingenuity at times. Q. How much does an electrician make? In 2017, the median salary for an Electrician was $58,680. The top 25 percent made roughly $67,000, while the lower half made nearly $51,000 per year. Electricians with less experience and training are going to be on the lower end of the spectrum. While highly trained electricians with a diverse knowledge of the field are likely to make more money. Q. What does an electrician do? An electrician is the go-to person for all of the power supplies in the city that you live. Your local electrician will install and maintain all of the electrical systems in our homes, schools, work, and everywhere else requiring power. Some electricians build the wiring systems and some electricians specialize in maintaining, fixing, and upgrading the electric units and equipment that has already been installed. Q. How long does it take to become an electrician? That really depends on the route you take in your education. If you go for a certificate in electrical technology, then you can start a career within a couple of months, but if you go to a community college to earn your associates degree then you are looking at roughly two years of full-time schooling. After you graduate or receive your certificate, you won’t be thrown directly into the bullpen, you’ll need to do an apprenticeship for about four years. This will include on the job training, combined with classroom instruction- and of course, it’s a paid position. Q. Is electrician a good career? To make a long answer short, yes, being an electrician is a great career. If you like to work with your hands, challenge yourself, good with physical labor, and enjoy the inner workings of electrical equipment, then being an electrician is the perfect job for you. Q. Is there a demand for electricians? Most of the country runs on electricity, so there will likely always be a demand for electricians, but if you are looking for job security, you may want to think about diversifying your skills. Look into voice, data, and video wiring, which are all becoming very necessary in the changing world. New homes and buildings are also being built on a daily basis, which means more electricity. The growing population needs power, and an electrician is the go-to career choice for that.